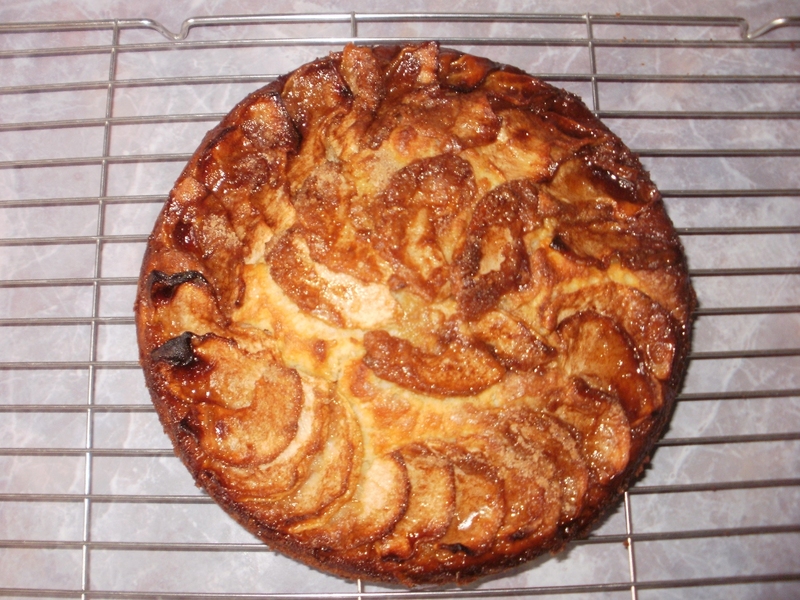 Found this recipe online whilst looking for Suffolk apple cake. I know it’s the wrong county/country but it was still sticky and tasty. Not sure if the apple counts as one of your five a day though? 1. Preheat oven to 200 degrees C, 400 degrees F or gas mark 6. 2. Grease a cake tin. 3. Put flour, baking powder and caster sugar into a mixing bowl. 4. Put egg, milk and 1.5 oz of melted butter into a screw top jar (coffee jar is good). You can use a food processor if this is too low tech for you. 5. Shake well until all blended. 6. Pour blended mixture into flour mixture and mix with a wooden spoon to form a smooth batter mixture. 7. Pour batter mixture into the tin and level out so it is flat. 8. Brush top of mixture with melted (topping) butter (1 oz). 9. Peel, core and slice the apple thinly. 10. Arrange slices in overlapping rows on top of the cake. 11. Mix cinnamon and sugar together and sprinkle over the top of the apple. 12. Bake in the centre of oven for 35 – 40 minutes (depending on oven) until firm and brown. To check the cake is cooked put a knife into the cake mixture and if the knife comes out clean (with nothing on it) the cake is cooked. Entry filed under: cakes, food, recipes. Tags: cakes, food, indulgence, recipes, treat. Wow this recipe sounds delicious. I love the smell of baked apple… it’s so warm and welcoming. Thanks for sharing!